Dura Seal Hardwood Cleaner and Floor Wax cleans floors removing scuff marks and built up dirt while adding a soft sheen to waxed hardwood floors. One gallon of this Hardwood Cleaner and Floor Wax covers approximately 500 square feet. This cleaner and wax comes in the coffee brown color for dark finished floors. It is also available in the Neutral color for light floors. Dura Seal has been providing products to flooring professionals for over 100 years. You'll feel safe using their products because they offer a 100% formulation guarantee. -Moisture causes wood to expand and contract so wiping up spills as soon as possible is a necessity to prevent damage to floors. Do you need a cleaner for your un-waxed finished hardwood floors? 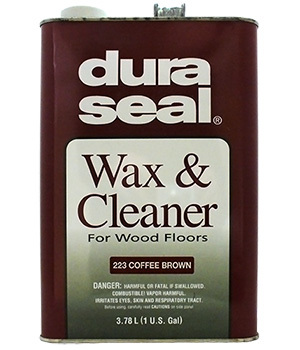 Dura Seal 32oz Hardwood Cleaner is a great choice. Just one bottle will cover 2,400 square feet. We also carry the Dura Seal Renovator which cleans and reseals hardwood floors and can also be used on terrazzo, concrete, or unglazed terra cotta tile. Protect the surface of your floors while giving them an affordable facelift. Order your Dura Seal cleaner and floor wax today.